As the summer skirts on by, my teacher instincts are gradually beginning to slide into prep mode. I love to draw and incorporate that artwork in my classroom as much as possible. In preparing for the Back~To-~School season that's just about a month away now, one of the biggest themes to work with and use are apples. 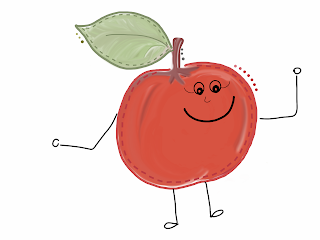 Yes, I must admit, I am one of those teachers who absolutely loves apples mixed into the curriculum where ever and whenever possible! So as I was doodling, one of the bits and bops that I created was a cute little apple clipart. Hope you enjoy this sweet little offering!